Mother’s Day is a great day to spoil Mom with breakfast in bed or a special brunch where she doesn’t have to do all the cooking. Here are seven easy Mother’s Day brunch ideas that any mother is sure to enjoy. Most of these ideas are simple enough for children to make or at least help with. Even a cooking-challenged Dad can put these brunch ideas together. 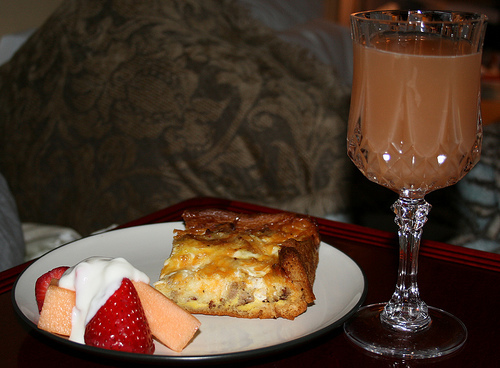 Here is an easy finger foods brunch idea that can be served to mom in bed. It’s easy to fix and easy to eat, with no need for even a fork! Feel free to substitute any of these suggestions for other finger foods you may like. Boiling eggs is easy. Get water to boiling on the stove, add in eggs, and boil for seven minutes. Cool under running water. Peel, cut in half, sprinkle with a bit of salt and pepper, and serve. Add a few pieces of cooked bacon or ham, or leave this out completely. Instead of toast, you might make some simple muffins from a mix. Slice up Mom’s favorite fruit, add a cup of orange juice, milk, coffee, or hot tea, and voila! Put everything on a tray and serve Mom breakfast in bed. Another simple breakfast to make for Mom is pancakes. Who doesn’t love fluffy pancakes topped with syrup? If you want to make them from scratch, go ahead, but an easier way is to mix them up from a baking mix or buy frozen ones and pop them in the toaster. You can do the same with waffles. Top with sliced fresh fruit and syrup, perhaps even a dollop of whipped cream, and you have a delightful Mother’s Day brunch. Another Mother’s Day brunch idea is the simple grilled cheese sandwich. If you think Mom would lean toward lunch rather than breakfast items, this will be a nice treat. Just put two slices—or more-- of her favorite cheeses between two slices of her favorite bread. Butter the outsides of the bread. Put it in a pan on medium heat, cooking until cheese is melted and bread is browned slightly. For added crunch and flavor, consider adding cooked bacon or ham before cooking sandwich. Slice sandwich diagonally (for looks!) and serve with fruit. If Mom likes eggs, omelets are a perfect Mother’s Day brunch item. Three eggs, mixed up with a bit of water or milk, will make a basic omelet. Spread out in a 10 inch pan, cooking it slowly. As the egg starts to cook just a little, add the ingredients to go inside. There are many choices: crumbled bacon, ham, or sausage; shredded cheese; chopped onions, tomatoes, mushrooms, green peppers; black or green olives; and even spinach. 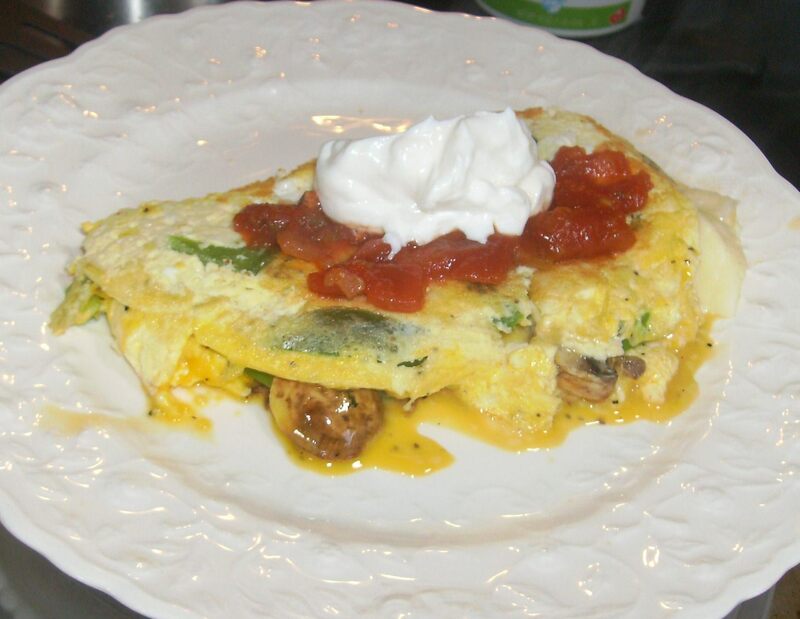 Omelets are great topped with sour cream or salsa, too! Of course, you can add a piece of toast or some fruit on the side. Egg salad is another perfect meal for a Mother’s Day brunch. From boiled eggs, adding mayonnaise, mustard, and relish or pickles, you can make egg salad to put in a sandwich or on a bed of lettuce. Adding tuna, ham, chicken, or turkey is another option. Here are several egg salad recipes to get you on the right track. Egg salad can even be served with crackers, alongside sliced fruit. If you really want to test your cooking skills, opt for a quiche. While a quiche isn’t really difficult to make, it does require a little more effort, in addition to some time in the oven. I have a favorite spinach quiche with swiss cheese that I adore, and there are many more options than that. Instead of spinach, you might fill your quiche with eggs only. Or eggs with ham or other meat. Or just eggs and cheese. The possibilities are endless. You can also make it easier on yourself and purchase a pre-made frozen quiche. Slice it up, serve with some fruit, and you have a perfect brunch for Mom. She will be impressed with quiche, no matter how you make it. Who doesn’t love potatoes in some fashion? Potatoes are good for any meal, and brunch is no exception. Here are some simple potato recipe ideas. You can make homemade hash browns by grating your potatoes directly into a skillet with oil, or you can buy frozen hash browns. You can chop up potatoes to cook on the stove, in the microwave, or in the oven. Serve with anything, such as the egg salad you made, or the quiche you have in the oven. Or serve a simple meal of potatoes and ham. Potatoes are versatile and pair well with just about any type of food. Make Mother’s Day special for Mom! Get in the kitchen and make something special with these seven Mother’s Day brunch ideas. These brunch ideas are simple enough for Dad and the kids to make, so there’s no excuse not to pamper Mom. And she will be thrilled with it! If you want to make the day extra special, order some fresh or silk flowers or other gifts to go along with breakfast in bed. Does Mom like jewelry? Clothing? Are books or music her favorite pastime? You might look around for Mom's favorites with online promo codes. 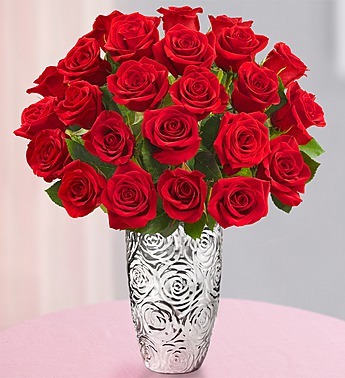 Mom is going to love the effort you put into her special day. Responses to "Top 7 Mother’s Day Brunch Ideas"